I either need to get some survival training or I need to stop reading books about the apocalypse. 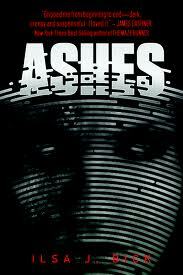 Ashes is an intense and thrilling addition to the genre, detailing what happens after an electromagnetic pulse kills the majority of adults and leaves most teenagers as cannibalistic zombies. Alex has never been lucky: first her parents died and then she was diagnosed with a brain tumor. While she hikes to scatter her parents' ashes, she manages to escape the worst of the calamity and teams up with a cranky young orphan named Ellie and a cute veteran named Tom. The three stick together as they try to survive, but my zombie reading experience warned me that nothing was going to work out. I loved this book. It kept me up late at night and had me panicking about the fact that I don't know how to start a fire or fight, and that I have two canned items in my cupboard. Ilsa J. Bick is insanely talented and able to weave a story that doesn't follow a predictable structure. Some of the sentences are so simple, yet knocked me out, like, "That was the last good time." This sentence pops up only halfway through the book, by the way. Ashes ends with one of the best cliffhangers I've ever encountered, and I actually didn't know that it is the first in a trilogy, so I scrambled to the computer to learn more. Happily, Shadows will be released in Fall 2012, so while I have a wait to learn what happens next, I am comforted to know that eventually I will know. If you love action, guts, being scared, and being surprised, make sure that Ashes is at the top of your To Read list.